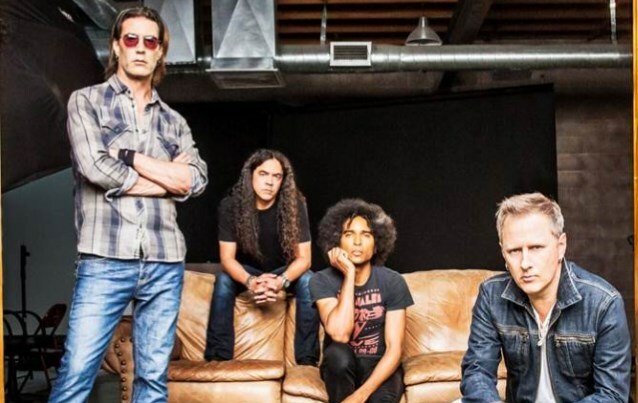 ALICE IN CHAINS is putting the finishing touches on the much-anticipated follow-up to 2013's critically acclaimed album "The Devil Put Dinosaurs Here". Due out later this year, the new disc was recorded in part at Henson Studios in Los Angeles with Nick Raskulinecz, who produced both "The Devil Put Dinosaurs Here" and its predecessor, 2009's "Black Gives Way To Blue", and is currently being mixed by Joe Barresi (TOOL, QUEENS OF THE STONE AGE). The basic tracks for the new ALICE IN CHAINS album were laid down at Studio X in Seattle, marking the first time the band had recorded in the city in more than 20 years, since tracking its 1995 self-titled album at the same facility back when it was known as Bad Animals. "It was cool to be back, because the studio is a part of our history," Cantrell told Guitar World. "The Devil Put Dinosaurs Here" was the band's second disc with singer William Duvall, who joined in 2006 following the death of Layne Staley.